Perfect with a cup of tea. I’d make it again although I’d cut the amount of sugar. Think it would also work with other fruit and jam combinations – plum (fresh and jam) with a hint of cloves or pear, fig jam and star anise. Might also try apple and cinnamon with gooseberry jam and lemon zest. It’s a good, basic autumnal cake recipe to play around with. Totally shameless, the main reason I’ve made this afternoon treat is to distract self and, I guess, to provide energy for continuing the task at hand, writing a stupid essay. I kept looking over my desk to the fruit bowl and a dark spot forming on one of the pears and thought they better be used up. 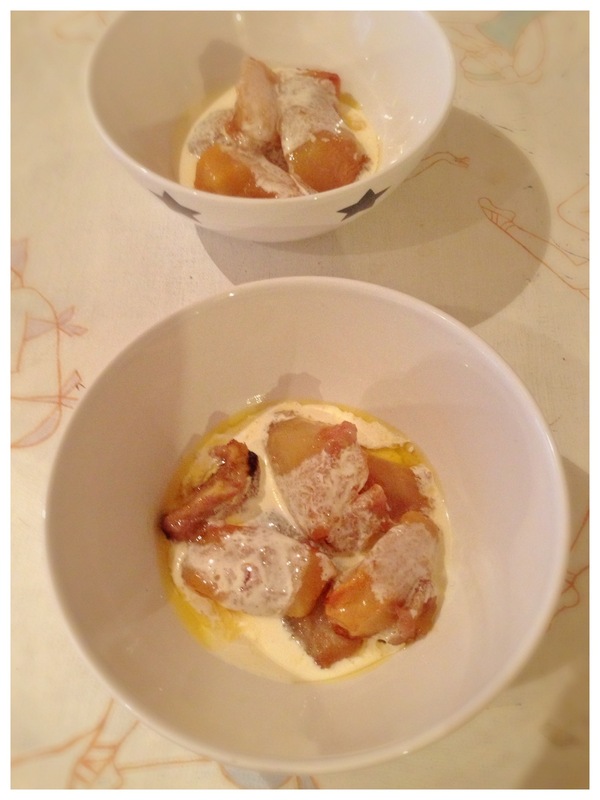 Nigel Slater has a recipe for pears in marsala, which gave me the idea. I used 3 pears, peeled, cored and quartered and an apple, peeled, cored and cut into 8 slices, sprinkled the lot with a bit of dark soft brown sugar, poured some Marsala (a healthy glug), mixed and baked at 180c fan oven for about half an hour, turning once. Served with cream and flaked almonds on top. Delicious and totally gone. Now back to writing stupid essay. Delicious. This followed a rather good lunch of acorn squash stuffed with leeks, cheese and cream with a Puy lentil, fennel and rocket salad, very autumnal (apart from fennel perhaps). Both recipes from Hugh FW’s Veg book, I really am working my way through it. Now stuffed and looking forward to going to theatre in a bit to see Eileen Atkins and Michael Gambon. Love her so rather excited about it! Heat the oven to 160 C and line a baking tray with greaseproof baking paper. Cream 120g softened butter and 100g soft brown sugar (I used dark), then mix in 1 large egg and 1 teaspoon vanilla extract until combined. On a slower speed, add 100g wholemeal flour, 1 grated apple (around 120g), 100g oats and 150g sunflower seeds, lightly toasted first. Take a heaped tablespoon of the mix and place on the tray, flatten lightly then bake for 12 minutes, until slightly brown around the edges. 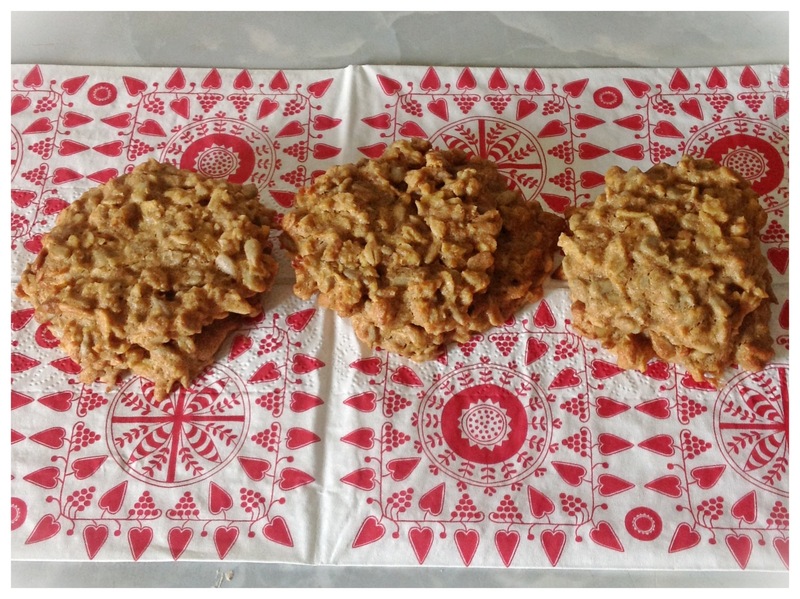 These cookies are not overly sweet – Dan’s recipe had 100g caster sugar instead of apple (he recommended apple for a slightly healthier version) but the apple also makes them softer. You can use pumpkin or hemp seeds instead or chopped nuts I suppose. I don’t think they will be ‘one a day’ though, more like gone in seconds.